Knowing how to find the Citroen Peugeot paint code on your car can make ordering body parts much easier. Below we show you where to look for your Peugeot Citroen colour code, this is the exact description of the paint color on your car. We mention these codes in the used car part descriptions in our online stock. 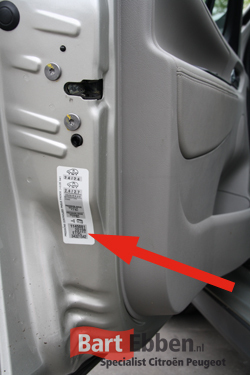 On many of the latest models the paint code can be found on the A-pillar of the car. Usually by fully opening the driver's door a white sticker is revealed. Near the bottom of the label the actual Peugeot or Citroen paint code is printed using 3 or 4 characters. 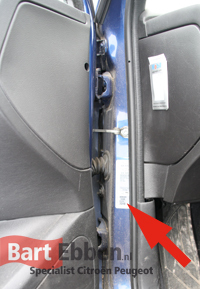 For example this method is used on a Peugeot 307. The B-pillar on the driver's side of the car is another common location for the Citroen Peugeot paint code. This where the Peugeot 206 colour code is located for instance, using a 3 or 4 character code as well. 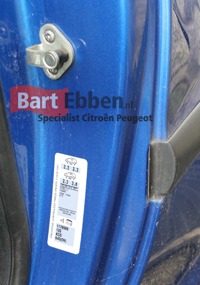 An exception to these descriptions are the Peugeot 107 and Citroen C1 paint codes, here the sticker is down low on the right hand side B-pillar. 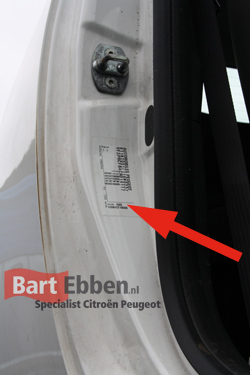 Another common location to find the Citroen Peugeot paint code is on the inside of the driver's door. On a Peugeot 207 this is where to look for the 3 or 4 character code printed on a sticker. 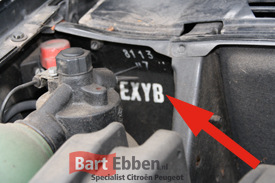 The less recent models like the Citroen Xantia or the Peugeot 306 often have their Citroen Peugeot paint code hidden in the engine compartment. 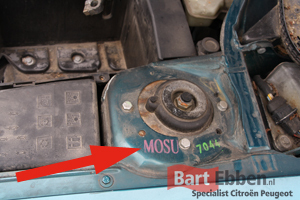 After opening the bonnet you should be looking on the car body near the suspension mounts or on the bulkhead het schutbord (body part between the engine and the dashboard). The colour code is marked with 3 or 4 characters, but now they are painted on to the body in a destinctive colour. By mentioning your Citroen Peugeot paint code in your second hand car parts request, our team will be able to answer your request very swiftly. In our online car parts stock we type the paint code in the part description as much as possible. There you can find out whether we have the part in our stock or not. This goes for a front or rear door, rear panel, front panel, front bumper, rear bumper, bonnet, wing mirror or tailgate.